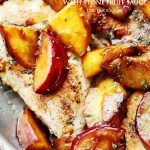 Jamaican Jerk Chicken with Stone Fruit Sauce – Easy to make, 30-minute meal including chicken rubbed with homemade jerk seasoning and topped with an incredibly delicious peaches and plums sauce. Oooooh I wanna take you down to Kokomoooo…. Hello HI! What’s happenin’, friends?! Do you feel what I’m feeling? Fall energy creeping up?! Tomorrow is the first day of school around these parts and with that comes… Halloween!? NO? 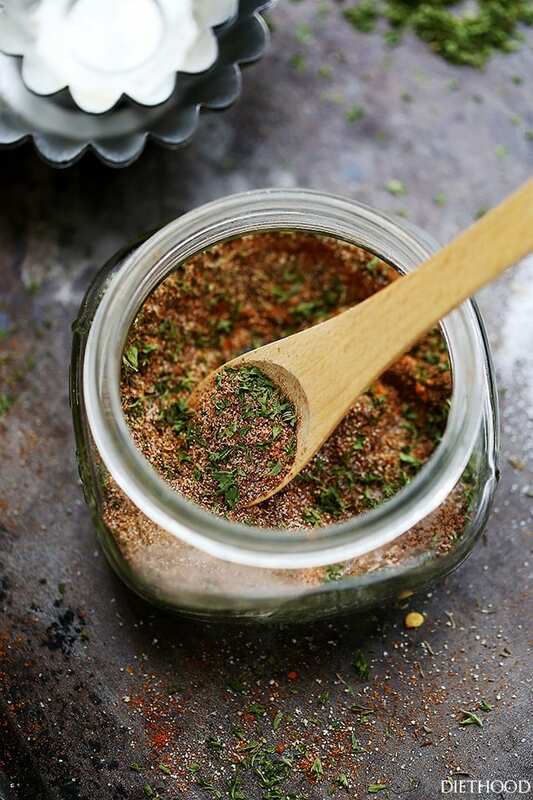 However, my version of it is a bit milder, though you can control the heat because I also made us a Homemade Jerk Seasoning recipe that you can get right here! Sidenote (because, I’m a scatter brain): Uhm, now we’re making our own blends?! Wow. My grandmas would be beyond impressed! But, this this this this sauce! This stuff is yummy! I also have to tell you that I was seriously disappointed by the peaches I bought last Friday. No.taste. NONE! They sat in the fruit basket up until Sunday when I decided to make this meal for you. At first, it was just going to be the chicken, but throwing the sauce over it was a super awesome idea! The hubs hates the whole fruit over savory thing, but he changed his mind after biting into this. And I’m not just saying that… he really did! Maybe I should just shut it and give you the recipe. Yeah? OK! Make it, eat it, LOVE it! 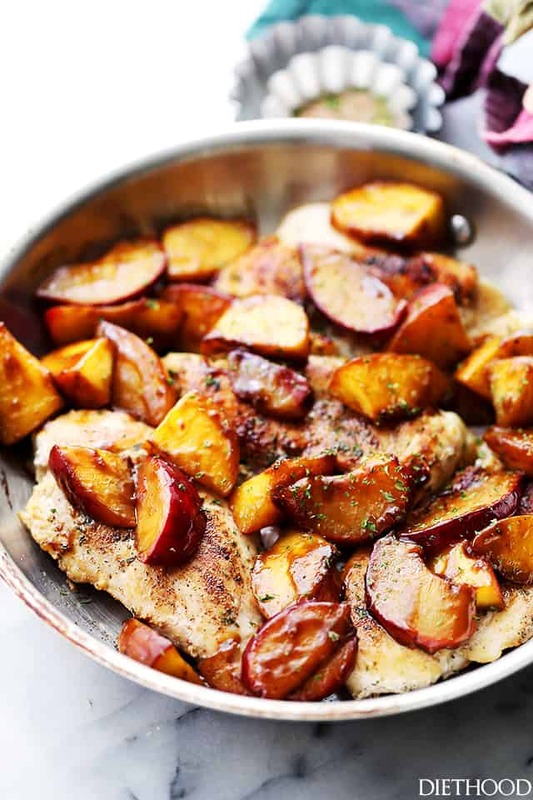 Easy to make, 30-minute meal including chicken rubbed with homemade jerk seasoning and topped with an incredibly delicious peaches and plums sauce. Sprinkle jerk seasoning over chicken pieces and rub in with your fingers. Heat olive oil in a large nonstick skillet over medium heat. Add chicken and cook for 10 to 12 minutes, or until chicken is done, turning once halfway through cooking. Remove chicken from skillet and transfer to a plate; keep covered. In a small bowl, mix together water and cornstarch. Add fruit, sugar and salt to skillet. Stir in the cornstarch mixture and bring to a boil. Reduce heat to low and continue to cook for 10 minutes, or until fruit is tender and sauce is thickened, stirring frequently. 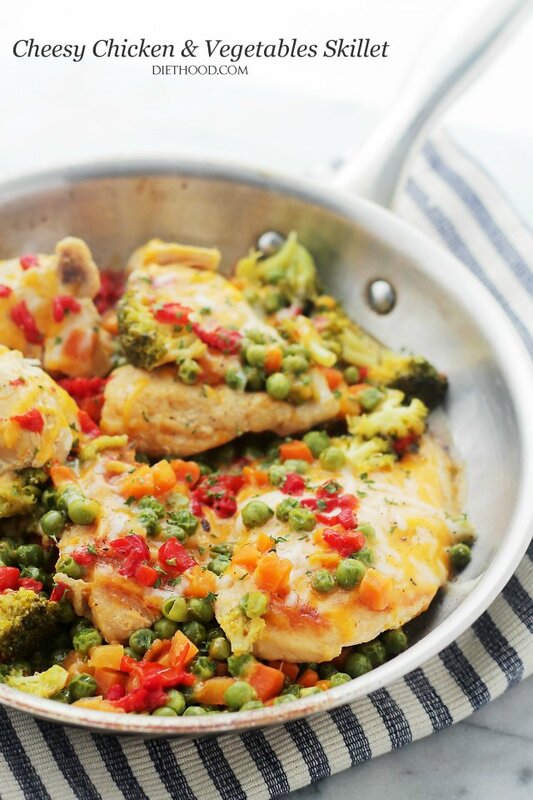 Spoon fruit sauce over chicken and serve. I love sweet and savoury together, fruit with meat is amazing. 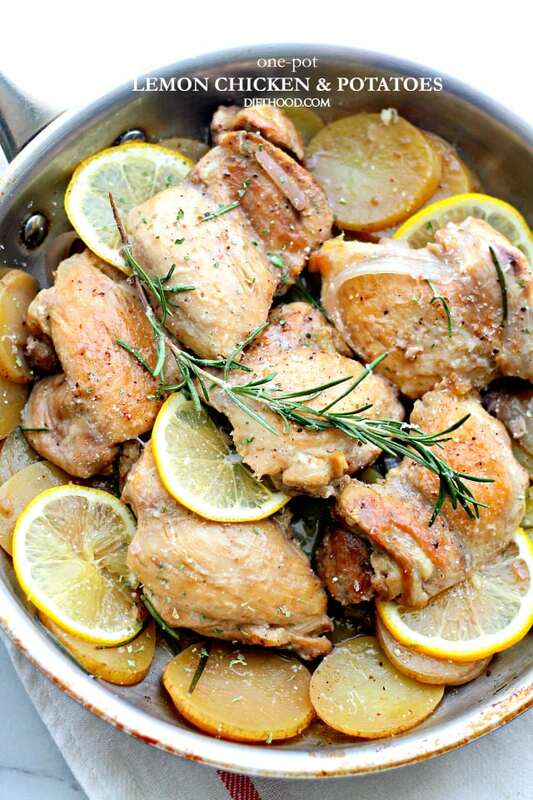 And this chicken looks just fantastic! Love that jamaican jerk rub! These pictures are so pretty! 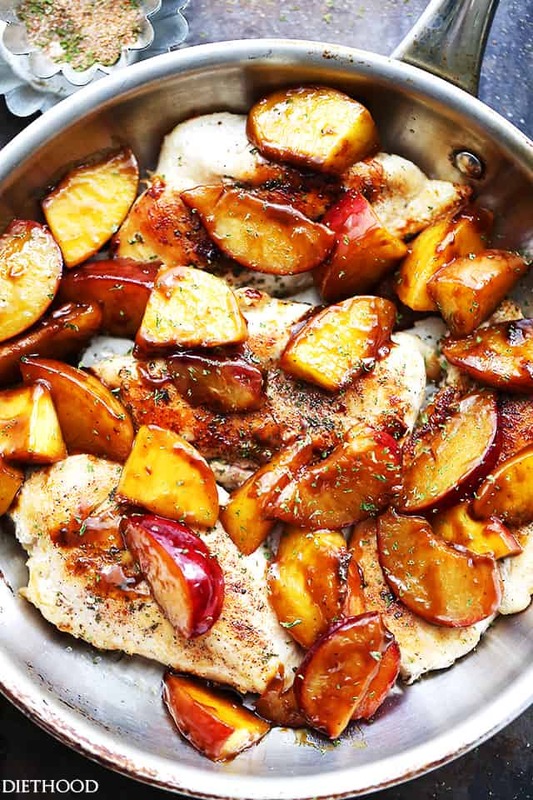 I love how you took a more traditional jerk chicken and paired it with all the awesome fruit that’s in season. Pinned! The shot of the jerk seasoning alone has my stomach growling!! I think I’m drooling! 😉 Love these flavors and that stone fruit sauce is so pretty! Welcome back! And I bought some peaches a few weeks ago, and was totally disappointed! No flavor. No bueno. But I am thinking this jerk dish would make up for those lackluster peaches! 30 minutes for that good lookin’ dish? I’m ALL IN! Hurray! I cannot wait to try your Caribbean Jerk Seasoning, I have just been using a general mix lately! 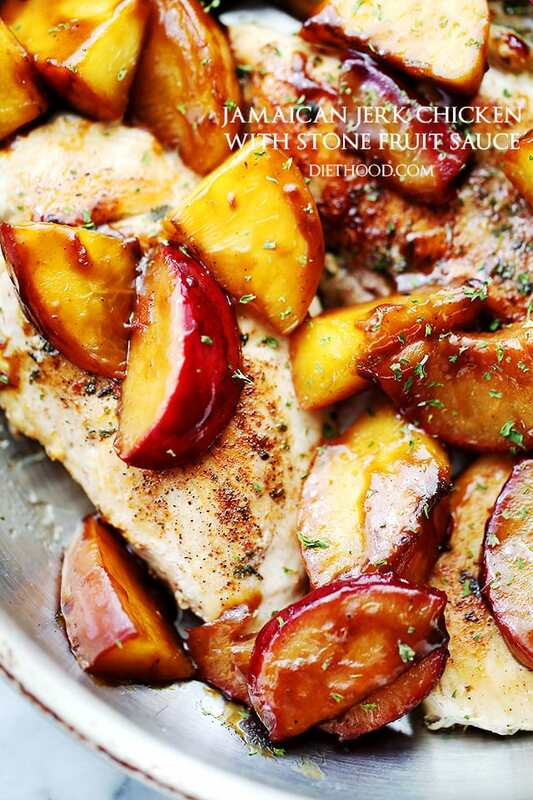 Love the idea of the stone fruit with this for a slight sweet and spicy action! Delish!